During my project of transposing my father’s scrapbook into my computer to preserve it, my research into the 11th Airborne, the Pacific War and the state of the world during that era grabbed my interest. I amassed a nice size manuscript with bibliography. And I do not appear to be alone in this interest. I discovered a multitude of forums and websites dedicated to that era and people searching frantically for any information on their relatives. In the posts to follow I will include not just the photographs, information and portions of letters (if not all) from the scrapbook, but the political aspects of the past that brought the world to such an explosive state. I will make every attempt to only post the facts. Should I find that I wish to make my own opinions on a matter, I will state it as so. I sincerely hope you not only enjoy this site, but also locate information that is helpful. 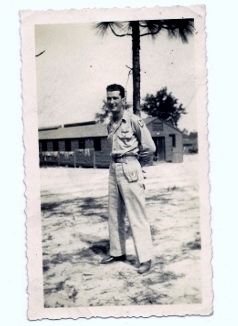 Posted on September 5, 2012, in Introduction, SMITTY and tagged 11th airborne, Everett Smith, WWII. Bookmark the permalink. 173 Comments. I have been five years late following your blogs so I will start from the beginning and catch up. It might take me a few months but hopefully the war is not finished yet so you are still around. Hate to see you go. Hope you have more stories to tell so it does not end. Even when this site does end – Hopefully I’ll still be hanging around Blogsville with all of you! You have a big following. It will be a shame to end it. I’m sure there are plenty of materials around to keep you going. Something you missed. Or do one posting a week instead of two just to prolong it. Why am I advising you? Sorry. I can’t help it. We’ll miss you. Maybe I’ll take a rest and then start another blog – a lot of idea rolling around in my head. Who knows. I get bored easily, so I’ll have to do something. Learn how to grow roses. hahahaha. Nope, No luck with rose or orchids. But I do have a few mimosa trees and blue spruce starting from seed at the moment. Rats! I can’t convince you to grow roses. Not even one? I know nothing about growing anything till I moved to LI. I just ordered a grape vine and a blueberry plant. I’ll see how those come up. I want a Colorado Blue Spruce for a long time but I have no room for that. I don’t have much room for it either, so I’ll let you know how they work out! Spent some time this afternoon reading through some of your wonderful blog. Love it! Plan to work back through your older posts. The photos, cartoons, and personal accounts make this history come alive! One of my great uncles served in the Marines in the South Pacific during WWII. I very glad you found the Pacific Paratrooper and will share more about your uncle in the future. Not only do we have a great batch of readers here, we have people contributing stories, historical data collected and those who wish to learn – you’ll fit in great!!! I’m so happy to discover your very interesting blog that you have dedicated to your father. My father has passed away but when alive, he seldom talked about his time in the war. He served with the Detachment 101 of the Office of Strategic Services that operated in the China-Burma-India theater. Your Memorial day tribute was wonderful as are the posts that I have had a chance to read. Thank you very much, Karen. If you care to have your father’s name listed in the Farewell Salutes, please put his information here in the comments and he will be added in my next post. Hello, my fellow blogger. I am getting more and more attracted to your posts. So I was curious and went back to your very first posts. The information was a real eye opener for me. It showed even when we are fortunate enough to live in a democracy, there is always the danger of being manipulated. Let us be vigilant in these turbulent days of the 21st century. Thank you for your contribution to peace and understanding! Yes Peter, even in a democracy, power and fame can go to anyone’s head and they will manipulate and pull any strings it takes to get more. Thank you for taking the time to go back in the Archives – I greatly appreciate that! Thank you for your kind words and for sharing part of your story, Ana. We’re always open to hear more. I’m glad you like it here. Have you received your award yet? I just came back – what a wonderful thing for you to do to remind people that this site is dedicated to my father, Smitty, and the 11th A/B. You have been my friend and teacher since the very beginning – Thank You! Even if I am a retired teacher, I still have it in my blog. A good teacher is the one who piques his students’ curiosity. Very true. I had a few of those in my time in school, one reason for my education in science. It’s funny how memories like that are hidden and then pop up out of the blue. This is why Notes’ post about Recollections led me to this new series of posts about the Teacher’s Pet Awards. I read your link and commented on it. A very worthy effort, I will try to get something prepared before the deadline. I hope my influence on you has been a positive one. I was born and raised in the Philippines; father was in U.S. Army Air Corps and was part of the liberation of the PI. A lot of my childhood friends’ parents and relatives were rescued by the 11th Airborne’s raid at Los Banos internment camp, which I understand is the model for air assault since there were few American casualties. Although there was a book (Angels at Dawn), not sure why there hasn’t been a film, as with the Ranger raid at Catabanuan. Los Banos was more complex, since it also involved water evacuation across Laguna Bay. My sentiments exactly, Spencer, it was a much larger operation for Los Banos. Hollywood though always felt that the Marines in the Pacific drew the attention and only seem to give credit to the army in Europe. (making money is the answer to that one). The book, “The Los Banos Raid: The 11th Airborne Jumps at Dawn” by Gen. E.M. Flanagan is a prize for me in my collection, not only because of the Angels, but I have had the privilege of talking with the general twice on the phone. Have a wonderful day! Gotta have to go back to the very start to gain a better perspective on your blog. Your recent posts about ANZAC weren’t foreign to me, so I thought I might start from there….but thought otherwise when I started scrolling down. Well, I’m excited to read the succeeding posts now! Beautiful blog! Hope you enjoy yourself, my readers are part of compiling this site – I consider it to be a joint effort. Every time I visit your blog, I wish you could pay a visit to the fascinating Australian War Memorial in Canberra. It is a beautiful memorial and, even more, it is a vast museum covering all the wars that involved Australian forces. It has lots on the Pacific. I think you’d spend days there. I would very much like to visit, not only Australia, but New Zealand as well. Smitty always wanted to get back there too. I have 2 problems, money (of course) and my other half WILL NOT get on a plane. Believe me I’ve tried them all, WILL NOT get on a plane. I actually miss it myself. thank you for the support, it is really appreciated! Thank you, Frank. I feel we all benefit from knowing history – even if it hurts a little. I also am trying to make certain all veterans are remembered. I am honored that you would include me on your site and your acknowledgement of my family’s contributions, Pierre.